Meeting report: Flowers are always a good excuse to meet! By Cristina Ferrándiz and Francisco Madueño. It is roughly 25 years since the ABC model of flower development was formulated, and still we find in its elegance never-ending inspiration for our work… With some “flavour” of a big anniversary, members of many groups, which were connected almost through family ties with the model, met for the latest biannual Workshop on Mechanisms Controlling Flowering. 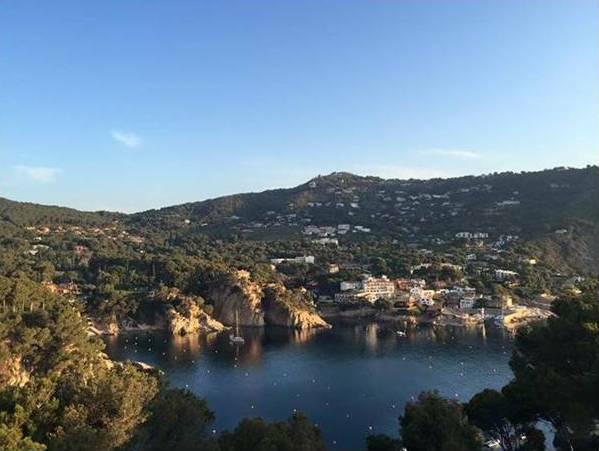 The Workshop was held from 7th to 11th June, in Aiguablava, a nice spot in the Northern Mediterranean coast of Spain, with the generous support from the Journal of Experimental Botany, the Company of Biologists and EMBO. More than 100 participants, who came mainly from Europe, but also from many other places around the world, like China, Korea, Japan, Australia, USA, Mexico and Brazil. The Workshop was organized in five sessions. Altogether, 73 participants (almost ¾ of the total) reported their work in some type of oral presentation, maximizing the communication of their results to the audience. Many of the diverse fields of study relating to flowers and flowering were represented, from the mechanisms that control the initiation of flowering to those that regulate the developmental processes that occur within each floral organ type. Wide-ranging aspects of these processes were discussed, with a special focus on emerging technologies applied to uncover the molecular mechanisms underlying the transcriptional regulatory networks of morphogenesis and organ patterning. The opening session was about Floral Transition. George Coupland talked about the latest results of his group on how plants acquired competence to flower, the role of miR156/SPLs and gibberellins, and how functional variation in this route can help us to understand the differences between annual and perennial species. Soraya Pelaz linked the TEMPRANILLO genes and their role in flowering also to GAs and to a new role in the regulation of trichome initiation in Arabidopsis. Jim Weller gave a nice overview on recent progress in flowering pathways in temperate legumes. Last invited talk of the session was from Markus Schmid, who put still more arrows pointing to FT from all corners of the flowering pathways map, including the recently incorporated sugar-mediated route. In addition, 5 oral presentations and five flash talks covered exciting advances in flowering regulation in Arabidopsis but also in other species such as tomato and rice. The second session was on Inflorescence Architecture and Meristem Patterning. Robert Sablowski initiated this session talking on the fundamental question of how cell growth and cell cycle are coordinated to shape plant organs, presenting his last results on how the transcription factor JAGGED contributes to this process. The talk by Phil Wigge was about transcriptional networks, with a focus on regulation of flowering and plant architecture by temperature, and introducing the view that a good transcriptome prediction (tradiction) can be done based on data from a few selected genes. Paco Madueño talked about transcriptional control of TFL1, presenting data that put this important, though classically poorly connected inflorescence regulator, on the map of flowering pathways. François Parcy, last invited speaker in the session, presented novel structural insights into the mode of action of LFY, highlighting the importance of LFY oligomerization to act as a pioneer transcription factor. Four additional oral presentations and 5 flash talks completed the session, with novel exciting data on how well-known and novel regulators act, their connection with hormones, with other transcription factors, etc., to control inflorescence architecture and growth in Arabidopsis, tomato, petunia and rice. Third session, the longest one, was on Floral Organ development. José Luis Riechmann opened the session describing his genome-wide studies on Arabidopsis, from analyses of the mode of action of CAL and CUC1 transcription factors to the contribution of sORFs to flower development. Martin Kater continued on gene regulatory networks but making a turn to floral female organs, ovules, and rice, focusing on the function of OsMADS13, the rice STK homologue. Lars Østergaard reminded us that auxin “rules us all”, explaining its role in guiding the unusual transition from bilateral to radial symmetry in the apical gynoecium, which is mediated by a newly uncovered mechanism of auxin perception by direct interaction of IAA with transcription factors. Gerco Angenent moved to tomato, other popular species in the meeting, and back to MADS, with a detailed analysis of how SlFUL1/2 proteins achieve specificity in their dual regulatory role in inflorescence and carpel development. Cristina Ferrandiz presented a different perspective on gynoecium development in Arabidopsis, talking on how different combinations of transcription factors may specify the different tissues of this complex structure. Returning to rice, Dabing Zhang talked about ABCDE-function MADS-box genes on floral organs and a newly discovered role of jasmonate in grass inflorescences. This was a popular session, so 8 more oral presentations and 13 flask talks contributed to broaden our knowledge on how floral organ shape, size and identity are defined in different species, the factors underlying stamen, carpel and ovule development, the role of plant hormones in organ patterning and even taking us to the mysteries of rose scent. There was also a session dedicated to Evo-Devo. Charlie Scutt took a nice walk across the angiosperm phylogeny, focusing on the changes in molecular properties of a small set of transcription factors, identified by their key roles in Arabidopsis carpel development, that could be traced at different positions in the tree. Günther Theissen zoomed in to Brassicaceae fruits to explain the evolution of different seed dispersal mechanisms and the reasons to be heteromorphic. 4 more oral presentations and 3 flash talks brought petunias, Nicotianas, and even gymnosperms, mosses or algae, diving outside the floral world in the search of its origins. The last session was focused on New Technological Advances and Modelling. Kerstin Kauffmann effectively bridging from the previous Evo-devo talks, explained how to apply recent genome-wide analyses approaches to understand the evolution of floral gene regulatory networks. Jose Davila-Valderrain followed up, bringing mathematics to build dynamic models and to understand the constrains to generate diversity that these models predict. Two oral presentations and 5 flash talks rounded up the scientific sessions by giving us tools to look at transcription factors at work, to edit genomes with CRISPR/cas9 and to learn how to translate the increasing complexity of data being generated into models that allow to see the forest through the trees. The workshop had also many other ingredients for a great outcome. 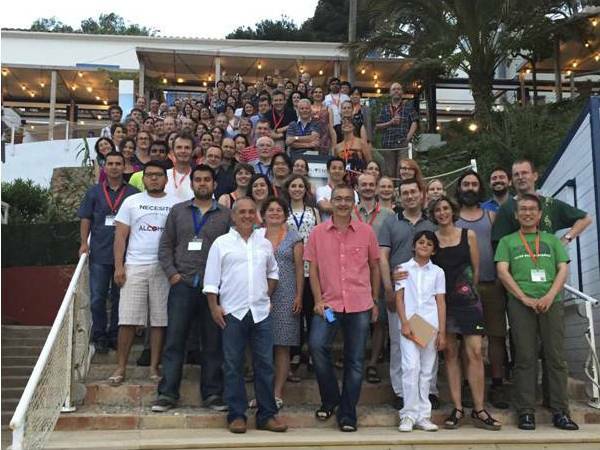 The venue, at the top of a really beautiful beach cove, was quite secluded and the participants were all staying together at the premises, maximizing the interaction between group leaders, postdocs and graduate students. The schedule of the meeting allowed enough free time for relaxed discussion outside the talks, exchange of information, arranging scientific collaborations and consortiums for students to explore postdoc opportunities for their near future and, of course, to have fun! In summary, a successful, highly interactive and very interesting Workshop that strongly helps to maintain the “Floral Development” tradition of Europe as leading actors in the field.